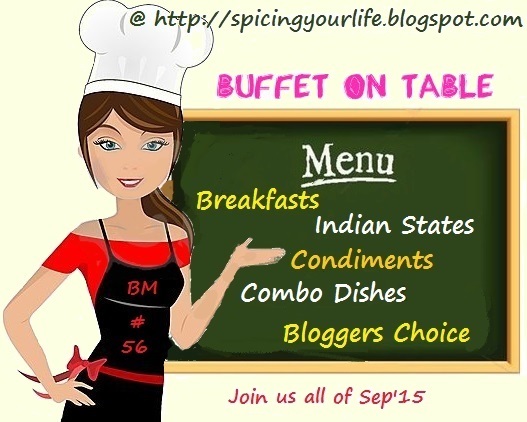 September 2015 has been one wonderful experience for us in the Blogging Marathon group. If you are landing here for the first time, then let me take a moment to explain that we in the Blogging Marathon, do a monthly and a biyearly full month Marathon. All the BM editions are based on themes. Even the Mega BMs have a theme going on. This was the logo for the Mega BM showing off a lady Chef having a menu on the board. And what a menu it has turned out to be! As you see on the Board, we had 5 themes, one for each week. We are 20 of us and all did the same theme for each week. Mexican Tortilla Chips with Homemade Cheese Dip and Tomato Salsa Sauce! Thats all folks! Hope you all enjoyed this as much as I cooked and fed my family! It was fun doing the mega marathon and I can't believe I did 4 of these. I had loved all your posts, specially Thali's..and I was drooling over them once again…Valli this time the clicks have come out really good…very vibrant..super mega marathon! It was so much fun running this marathon with you Valli. Thank you for being such a wonderful organizer and host. Looking forward to many marathons like this in the future. You just rocked Valli especially your Thalis are the best.. Loved running this long marathon with u.. It was so much fun and thanks a lot Valli for this opportunity. Very useful post, Valli. Loved to be part of the Marathon. Lovely recap Valli and as usual loved to be a part of this marathon.